Samsung Galaxy A9 (2018) has been launched recently in Kuala Lumpur. Behind the phone, the main attraction of this phone is the presence of four cameras. This smartphone is the first launch of a four- rear camera. This phone comes to India Galaxy A9 (2018) has four rear cameras with 18.5: 9 aspect ratio display, up to 8GB of RAM and up to 128GB of storage. The price of 6GB RAM in India is 36,990. 8GB RAM will cost Rs 39,990. This smartphone can be found in India in three different colors. New Samsung Galaxy A9 can be found in the smokest online store and offline store. Customers will receive a discount of 3,000 by purchasing the Galaxy A9 and HDFC credit and debit card. Also, the Korean company's company has come up with an attractive EME offer with Airtel. The sale will start on 28 November. Dual SIM Samsung Galaxy A9 (2018) will run Android Oreo operating system. Galaxy A9 (2018) will have an 18.5: 9 AUSSPEC 6.3-inch FHD + Super AMOLED display on the phone. The Snapdragon 660 chipset, 6GB / 8GB RAM and 128GB storage will be within the phone. Samsung Galaxy A9 (2018) will have four cameras behind the phone. This phone's primary camera sensor is 24MP. There will also be a 10MP telephoto lens, an 8MP wide-angle lens, and a 5MP depth sensing sensor. 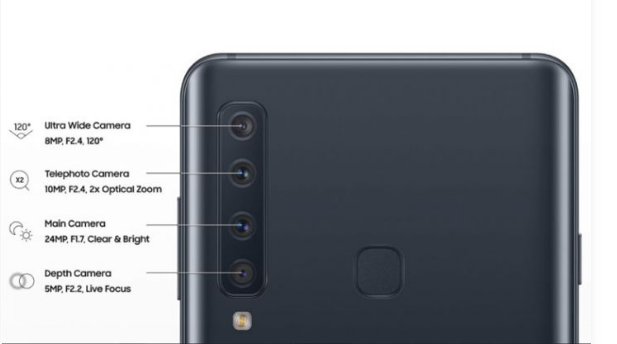 Galaxy A9 (2018) has a 24MP cell phone camera in front of the phone. For connectivity Galaxy A9 (2018) will have 4G VoLTE, Wi-Fi 802.11ac (dual-band, 2.4GHz, and 5GHz), Bluetooth v5.0, USB Type-C, NFC and a 3.5mm headphone jack. Also, Galaxy A9 (2018) has a 3800mAh battery inside the phone.